And what’s the best way to celebrate a special occasion? With cake of course! You’re looking at gorgeous red velvet cupcakes topped with swirled red, white and blue frosting and filled with red and blue mini M&M’s. Piñata cakes and cupcakes are so much fun to make and even more fun to eat – when cake and candy combine! Are you celebrating Fourth of July next week? 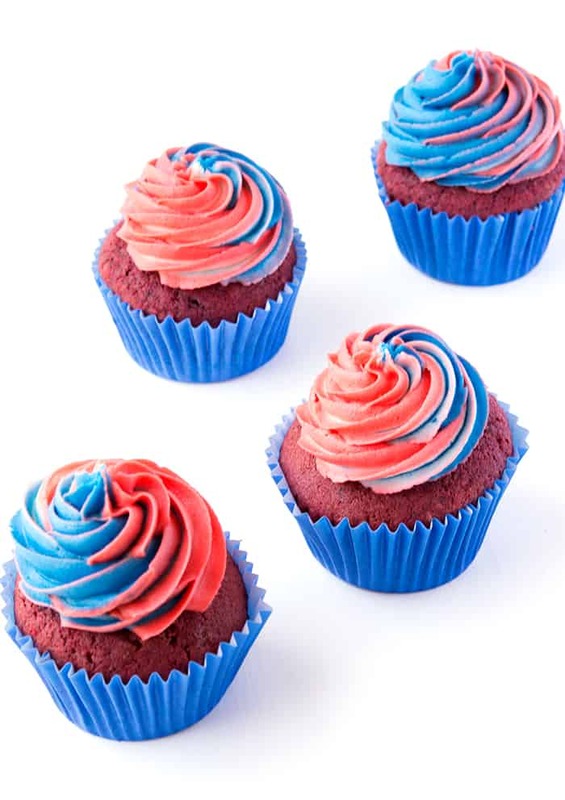 I’ve been seeing lots of red, white and blue foods popping up all over the place and I was only too happy to oblige by making these gorgeous red velvet cupcakes. I started with my all-time favourite red velvet cupcakes. They’re soft and fluffy and boast a lovely cocoa and vanilla flavour. A little red food colouring gives them their signature pop of colour. To make these cupcakes even more celebratory, I topped them with gorgeous vanilla buttercream, dyed three different colours. Add all three to a piping bag and watch in awe as pretty patterns naturally emerge. It is so much easier than you’d think to create this swirled frosting! The final touch is a secret stash of mini red and blue M&M’s. 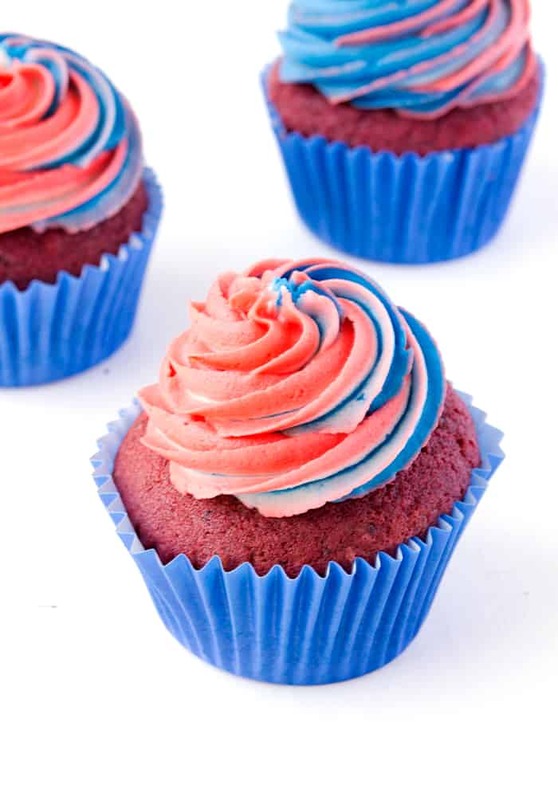 Not only do they make for a sweet surprise but they transform these into the ultimate Fourth of July Cupcake. How was your weekend? I worked on three different recipes for blog, one being these cupcakes and two more that I can’t wait to share with you. We also had a lovely dinner with friends and breakfast at beautiful Bondi on Sunday. 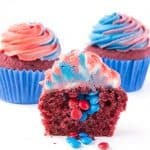 If you’re celebrating Fourth of July or Independence Day next week, you could either make these Red Velvet Piñata Cupcakes or try my Fourth of July Peanut Butter Cookie Cake with swirled rainbow frosting. Enjoy! 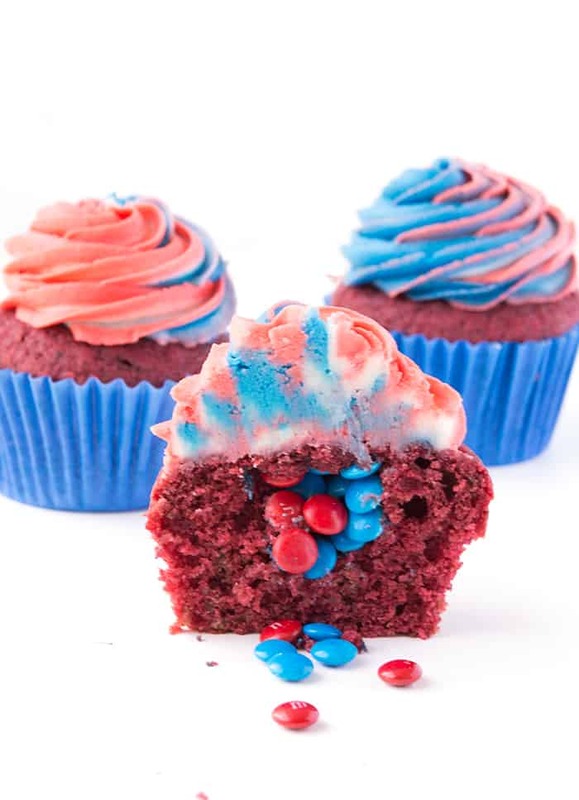 Gorgeous Fourth of July Red Velvet Piñata Cupcakes topped with red, blue and white frosting and filled with red and blue mini M&M’s! Preheat the oven to 180C (360 F). 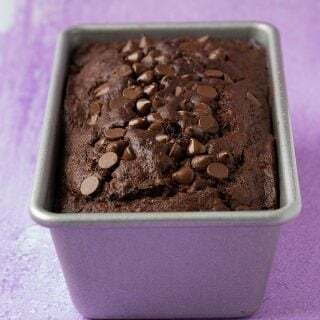 Line a 12 hole muffin tin with patty cases. 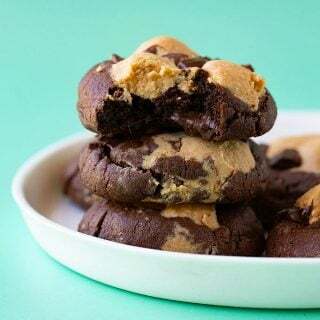 In a large mixing bowl, sift the flour, baking soda and cocoa powder, then add the sugar – give it a good whisk. Pop the butter into the microwave for a short time, 20 seconds or so at a time, stirring until it is just melted. Give it a stir with a fork to eliminate any lumps. In a separate mixing bowl, add the eggs, vanilla and butter and whisk together until smooth. Add the greek yogurt and give it a stir – don’t worry if it goes a little lumpy. In a separate small bowl, add the food colouring and vinegar. Add the wet mixture into the dry mixture, along with the food colouring and gently fold until just combined. Spoon the mixture into the prepared patty cases and pop into the oven. Bake for around 16-18 minutes or until a skewer inserted comes out clean. Set cakes out onto a wire rack and leave to cool completely. Once the cupcakes are cooled, carefully cut circles out of the middle of each one and set aside the tops. Fill each cupcakes with mini M&M’s and place a small lid of cake back on top. To make the icing, add the butter to a large mixing bowl, beat with an electric mixture until soft and creamy. Gently sift in one cup of the icing sugar and continue to beat. Add a tablespoon or two of milk to help loosen up the mixture. Add the rest of the icing sugar, one cup at a time. 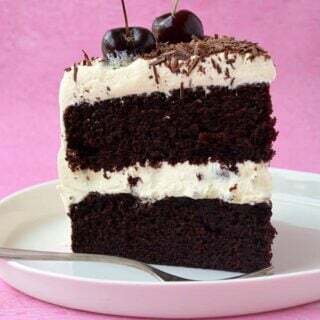 Continue to add a tablespoon of milk as needed – but be careful, you don’t want the frosting too runny. It should be nice and creamy but thick enough to hold its shape when piped. Divide the icing into two bowls, reserving a little bit to be the ‘white’ frosting. Add a little red food gel to half the frosting and stir until it reaches your desired colour. Add a little blue food gel to the rest of the frosting until it reaches your desired colour. 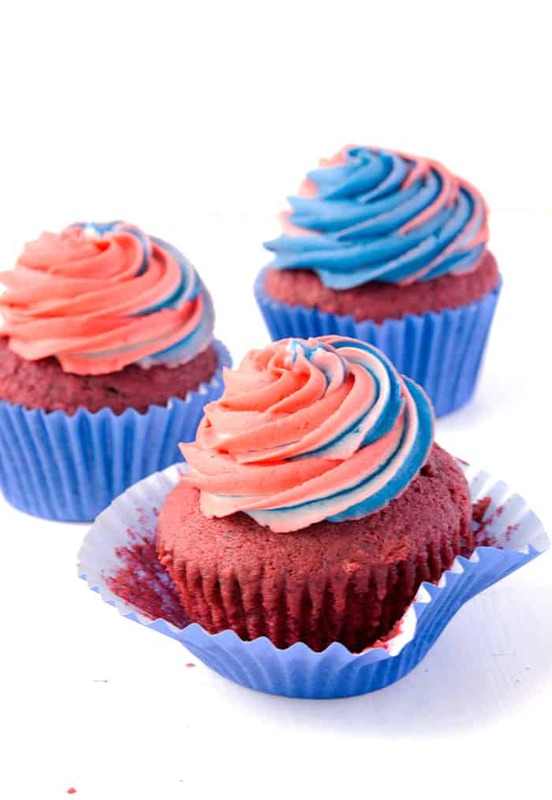 Add all three colours of buttercream to your piping bag (fitted with a large star tip) horizontally. Twist the top of the bag and then pipe the icing onto the cupcakes. The first one probably won’t have all three colours so use that one as a test run. Love this idea for July 4! These are SO CUTE, Jess! What a great way to celebrate the 4th! Ooooh, these are SO fun! And who wouldn’t love cupcakes filled with chocolates?! I know right? Best of worlds!